Porcelain veneers can address a number of cosmetic dental concerns such as gapped, overlapping, or cracked teeth. These thin, custom-made ceramic shells cover your natural tooth, concealing minor imperfections and flaws and ultimately enhancing the aesthetic of your smile. Using our advanced CEREC system at our West Valley City, UT, practice, Drs. David MacKay and Christopher Demille can design and place your veneers the very same day they take impressions of your smile. This technology enables us to provide our patients with effective, convenient treatments for optimal results. Porcelain veneers are custom-made to fit comfortably over your natural teeth. We can also alter the shade of your restorations, so they blend seamlessly with your your smile. What is the Same-Day Veneers Process? 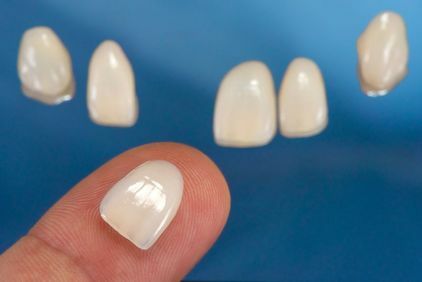 Prior to the development of CEREC technology, porcelain veneers required multi-appointment treatment and involved an outside dental laboratory. The entire process could take as long as two to three weeks to complete. For our patients' convenience, we can now perform every step of the procedure in-office during a single visit. Prior to treatment, we will examine the structure of your smile and review your cosmetic goals to determine if porcelain veneers are right for you. Because we consider patient education to be a top priority, we will always provide you with the information you need to make informed decisions about your treatment options. Using our advanced CEREC system, our dentists can design and place your veneers the very same day they take impressions of your smile. If you decide to proceed with treatment, we will then prepare your teeth for veneers. Our team will thoroughly clean your teeth and then carefully remove approximately one millimeter of enamel from the tooth surface. This process helps to ensure that your veneer fits comfortable and securely. Next, we can lightly etch the front surface of your tooth, which helps create a strong bond between your tooth and the restoration. Once your teeth have been prepared, we will take digital 3-D impressions of your smile, which will be used to design your custom veneers. These impressions are then sent to an in-office milling unit, which will carve your veneers from a block of ceramic. In less than one hour, we can place your porcelain veneers, revealing a new and enhanced smile. Same-day porcelain veneers offer a quick and effective solution to concealing minor dental imperfections. Veneers are considered to be a more conservative treatment than dental crowns, which require extensive reshaping of the tooth. In addition, veneers can address multiple cosmetic concerns at once. They are stain-resistant, and they provide natural-looking results. With proper care, veneers can last up to 15 years, allowing you to feel confident in the appearance of your smile for an extended period of time. At Demille MacKay Dental, we value continuing education, so every member of our team is up-to-date on the latest technologies and techniques. If you trust your cosmetic needs to our team, you can rest assured that you will receive superior care. Call our office at (801) 397-5262 or schedule a consultation online to find out if porcelain veneers are right for you.